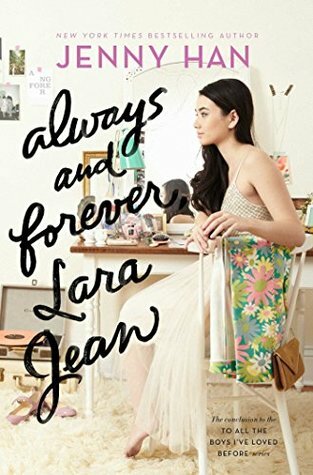 In the final installment of Han’s beautifully put-together love story, Always and Forever, Lara Jean takes readers on an emotional roller coaster as this unforgettable coming of age trilogy comes to a close. As they prepare for college life, Lara Jean and Peter take part in all the fun activities that occur as one exits high school. But as plans don’t seem to be going as intended, Lara Jean and Peter must reexamine their wants and dreams before they can even consider what their future together holds. A breathtakingly passionate story that’s nearly impossible to put down, Han sheds light in the most romantic way what it’s like to transition from high school to young adulthood. There are spoilers to the story in this review, which have been hidden with a “spoiler” button. Though this series was intended to be a duology, Han graced us fans with one more Lara Jean novel. Typically, I get nervous when authors do this; however, THIS book is what really made me fall for this series. It’s full of fun and passion, really bringing a nice close to Lara Jean’s high school days than its predecessor did. Personally, I find this book to be the BEST in this romantic coming of age trilogy. CONTENT & TRIGGER WARNING: This book contains moderate sexual themes, loss of a loved one, and substance abuse. For us “older” readers who have long passed the days of high school, Han’s story draws out this sense of nostalgia and euphoria of grander yet simpler days. Though I truly enjoy the age I’m at now, I couldn’t help but reminisce on my own high school experience. I firmly believe only truly gifted authors can cause a reader to recount in this dreamlike wistful state beautiful moments of our past, creating this longing to return to previous moments in time. Not only was this a truly wonderful feeling to have while reading the novel, but it tied in with Lara Jean’s train of thought. As she’s preparing for the next big adventure of her life, she recalls all the wonderful moments that she’ll never forget. From her friendship with Chris to her relationship with Peter, Lara Jean learns that even though she can’t predict the future, she’ll always have these fond memories to look upon. For those who are in high school and/or closer to Lara Jean’s age, this novel brilliantly highlights the changes those readers should expect to happen and how to handle moving forward after high school. Lara Jean experiences independence, the thought of separating from her friends and family, being introduced to new people, exploring new places that she’ll soon call home, and what it’s like when plans don’t go as intended. Though there are some bittersweet moments that Lara Jean grows rather emotional over, readers observe how the closing of one chapter in her life just opens an even greater chapter moving forward. It’s a great “send off to college” novel for this age group. As I mentioned in my review of P.S. I Still Love You, I greatly enjoyed Han’s attention to the family dynamics of the Song-Covey family. The connection feels so authentic, allowing readers to really connect with the characters. Always and Forever, Lara Jean digs even deeper into the importance of family as the Song-Covey gang has some MAJOR changes. These changes permits Han to explore what it’s like for each family member when such major changes occur. Kitty, Lara Jean, and Margot all encounter different thoughts and feelings, demonstrating the difference not only with personality types but by the age group and the memories each have from when their family included their mother as well. To All the Boys I’ve Loved Before and P.S. I Still Love You were wonderful reads…but I don’t know if I would’ve had such a positive experience with the series if she didn’t add Always and Forever, Lara Jean. The second book didn’t provide this CLOSURE that I think readers really wanted. In this book though, we get to see so much more of Lara Jean and how she’s turned out a year after the second book. From relationships to her application for colleges experience, there’s so much more sides of Lara Jean explored here that I truly loved. With this novel added, I can confidently say that I feel content with this trilogy now coming to a close. Though the drama definitely lessened since the first and second book, there’s still just a tad too much of it for my liking…this is particularly pertaining to Lara Jean and Peter. Click here to see spoilers. Lara Jean and Peter go through a rather rough period near the middle of the novel to the end, specifically about not being able to attend the same college. This definitely puts a strain on the relationship and this is understandable, but Peter just seemed to really hurt Lara Jean simply because she wanted to follow her dreams. I was hoping he’d grown up a bit more since the other two books and would’ve been more proud of her. I WILL defend him that he does own up to this near the end, allowing the two to work everything out. Peter grows immensely in this book, which I really enjoyed. Peter also goes through some major family issues in this book, so I believe that makes more sense as to why he acts rather “childish” during points in the novel. Even though this novel’s classified as a romance story, it also focuses greatly on the “coming of age” genre. Han does a fairly decent job at touching upon all the different genres in this book, but she fell short when it came to Lara Jean’s application for college. I was really intrigued with this element of the story, as Lara Jean experiences at firsthand the ups and downs of college application. The chapters where Lara Jean chooses the school she wishes to attend was fun, but I wanted more exploration here; there was little exploration of the campus activities and the classes and so forth, making it seem as though her decision wasn’t as insightful as it should’ve been. Always and Forever, Lara Jean adds an incredible amount to both Lara Jean’s character and the story itself. Readers are exposed to topics with much more substance than its predecessors, providing a both fun read and a learning experience for readers. The ending is a closed door but definitely not locked, allowing some thoughts of “what happens afterwards” for readers to explore and not ruining the story with a fixed ending. If you’ve read the first two novels and have a desire for something more, I strongly suggest giving Han’s Always and Forever, Lara Jean a go.